Internet has been tremendously increasing and the amount of data that we produce and consume is also increasing at an exponential level. Today, a major portion of data transfer comes through Torrent protocol P2P sharing methods. For data transfers through torrent, we use torrent clients among which uTorrent is the most popular torrent client. Through this torrent client, you can access loads of media, games and other documents which can be data consuming and heavy on your bandwidth as well as your pockets. Fortunately, you can set a Transfer Cap limit on the amount of data transfer possible through uTorrent in a given period of time. This article explains how to set a transfer cap in uTorrent and configure it, so that you could use only a fixed amount of data transfer in a given period of time. Using a transfer cap could be beneficial to users where they pay for the amount of data used, contrast to a fixed bill per month. Using a torrent cap will remind you about the amount of data transfer already done, and hence will save you from incurring heavy charges on your pockets. 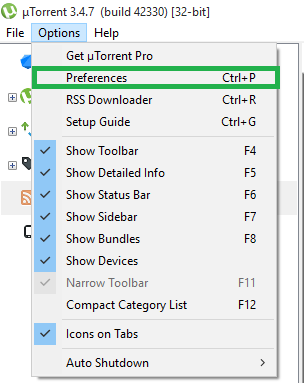 Open uTorrent client, and from the top menu bar, click on Options > Preferences, from the dropdown OR directly press Ctrl+P to open Preferences in uTorrent. In the 'Preferences' window, navigate to 'Transfer Cap' from the left panel of the window. 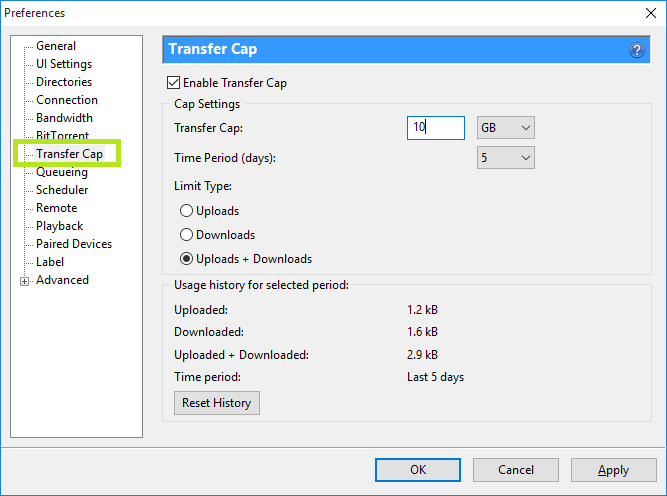 In 'Transfer Cap' window, check on "Enable Transfer Cap" to enable the data transfer limit, and set it accordingly to your needs. Under "Cap Settings", set the Transfer Cap to your choice, and Under "Limit Type" set if you want that upload and download both count to your cap limit, or either of them. You can set the number of days for which the transfer cap limit was set, after which uTorrent will stop any data transfer through it, and prevent you from extra costs. The bottom of this window shows you the statistics for the usage history for selected period, and you can reset it too by a click on "Reset History" but remember that when you clear your history, the usage stats will reset to 0 and torrent will not count those transferred bytes now, so be careful. After configuring all the settings, press OK and you are ready to work with your new transfer cap settings. PS- If you liked the post then share it to your friends using Facebook, Twitter or any platform you use. And if you have any queries post in comments. I would like to hear from you. If you have any other methods then please notify us.